An easy step by step tutorial for simple homemade sourdough bagels. Add your favorite mix-ins or toppings to create your own…mornings never tasted so good! There’s nothing like a fresh, hot bagel slathered in cream cheese. 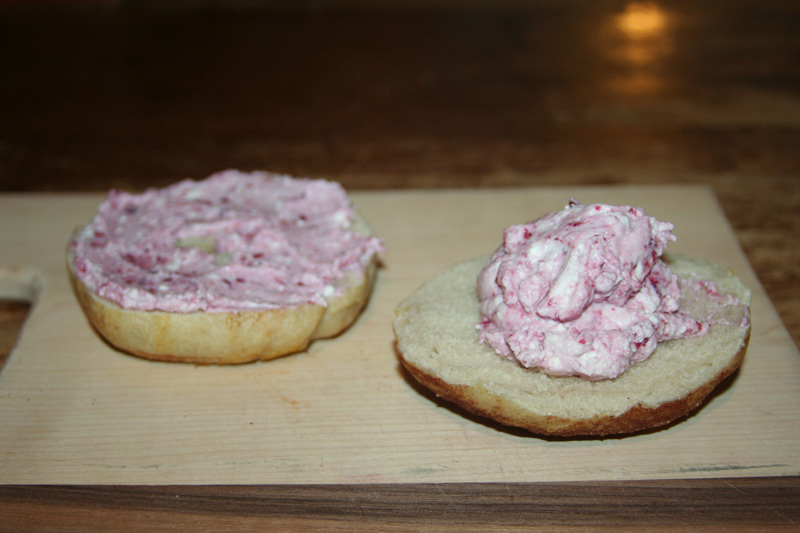 Remember when we made homemade cream cheese? Or rather, let the cream cheese make itself? Yeah, that was easy, and so yummy! But I’ve never tasted a store bought bagel as good as these homemade sourdough bagels. Are you hungry yet? I have such fond memories of my college days, frequenting the local bakery before classes and getting a fresh, hot bagel smothered with cream cheese. Fond memories or not, I know if I ate those now, my tummy wouldn’t be happy about it. Wanting a better alternative to those dense and chewy circles of joy, I turned to my trusty sourdough starter, Seymore – ya’ll know my deep love for sourdough! I knew there had to be a way to join these two loves together in marital bliss. Because sourdough bagels and cream cheese will live happily ever after in holy matrimony! If you’re new to sourdough, start here. If your sourdough starter “kitchen pet” is growing like crazy and you’re continually looking for delicious ways to bake up something special, then check out our eBook: Everyday Sourdough: Easy Recipes for the Everyday Baker. 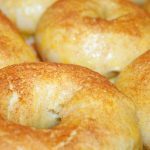 I was shocked just how easy this bagel recipe is…true, it’s time consuming, but most of that time is hands-off (as is the case with many sourdough recipes…it’s just the nature of sourdough). Now, gather your supplies and ingredients and lets get started with these simple homemade sourdough bagels. The first thing you’re going to want to do is to make sure your sourdough starter is VERY ACTIVE. A sluggish or hungry starter won’t work for this recipe, so be sure your starter is nice and bubbly and doubles in size within a few hours of feeding. For more tips on how to get a healthy sourdough starter, read this post. Once you have a happy starter, you can mix your dough together. This dough will be a much stiffer dough than you’re used to and will give your mixer quite the workout. Don’t worry, this is what you want! After dough has risen, turn out onto a lightly floured surface (or tea towel dusted with flour) and flatten out a bit. Using a pizza cutter (or sharp knife) cut dough into 12-18 equal portions. Don’t spend too much time being precise, you can always pinch a little dough off a larger piece and add it to the smaller corners. Grab a portion of your dough and, using the palms of your hands, roll into a ball. Then pinch through the center of the ball using your thumb and middle finger. Make a hole and begin to stretch the hole out until it’s the size of a 50 cent piece (or about 1.5-2 inches). Place bagels onto a cookie sheet lined with parchment paper and continue until all bagels have been formed and stretched. Arrange bagels onto a cookie sheet lined with parchment paper and cover with a slightly damp tea towel. Let rise until doubled in size (about 1 hour). 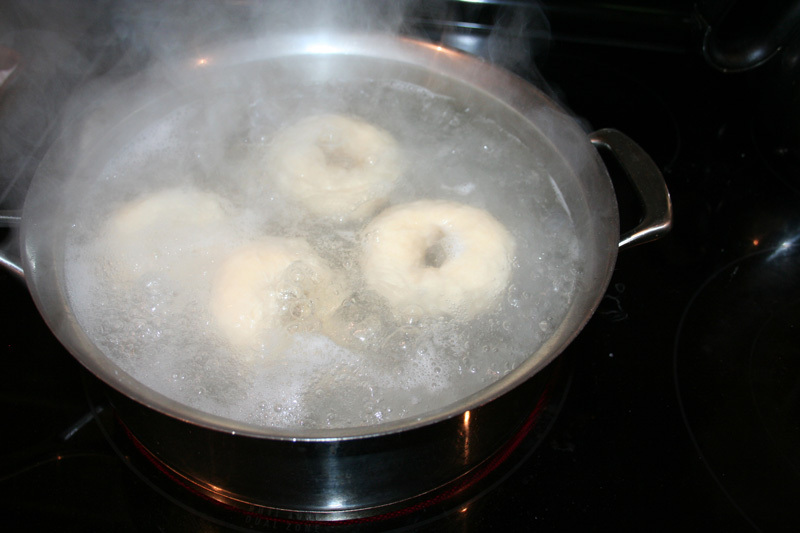 Once bagels have risen and doubled in size, boil a large pot of water (filled 2/3 full) and add baking soda. Meanwhile, preheat oven to 450 degrees F. Carefully drop bagels into the pot, as many as will fit without over crowding, and boil for one minute, flipping bagels over half way through cooking. 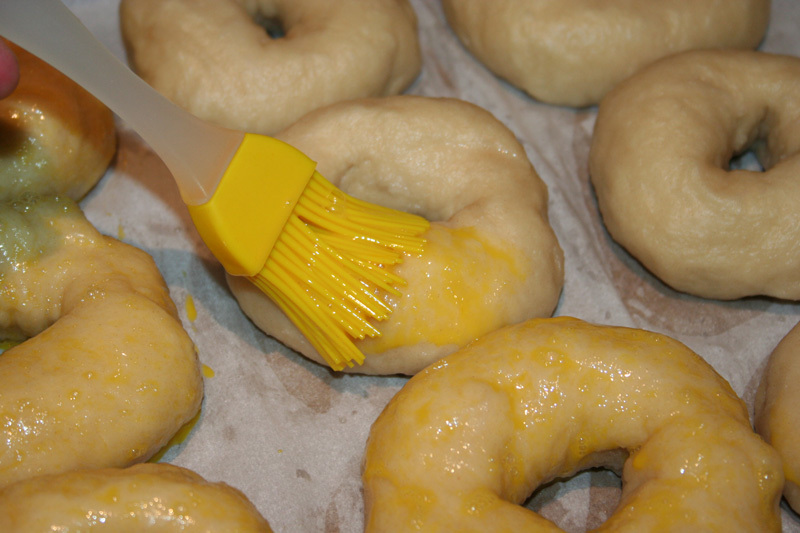 Remove bagels and allow excess water to drip off before placing them back on the baking sheet. (I like to remove the parchment paper from the baking sheet as I find it tends to stick to the wet bagels during baking. Instead, I lightly grease the pan with a touch of avocado oil to keep the bagels from sticking during baking.) Continue until all bagels have been boiled. Brush the bagels with egg wash and top with desired topping, or a combination of toppings (see our favorites below). Place bagels in the oven and bake for 15-20 minutes, or until bagels are cooked through and no longer doughy (you may need to rotate the pan halfway through baking). UPDATE: Remember to remove the parchment paper before this step! Many readers reported the parchment paper sticking to the bagels, so we now recommend using a bit of avocado oil on the pan to keep bagels from sticking. Congratulations! You now have incredibly delicious, better-than-store-bought, healthier than store bought bagels for you and your family! Look at these beauties! 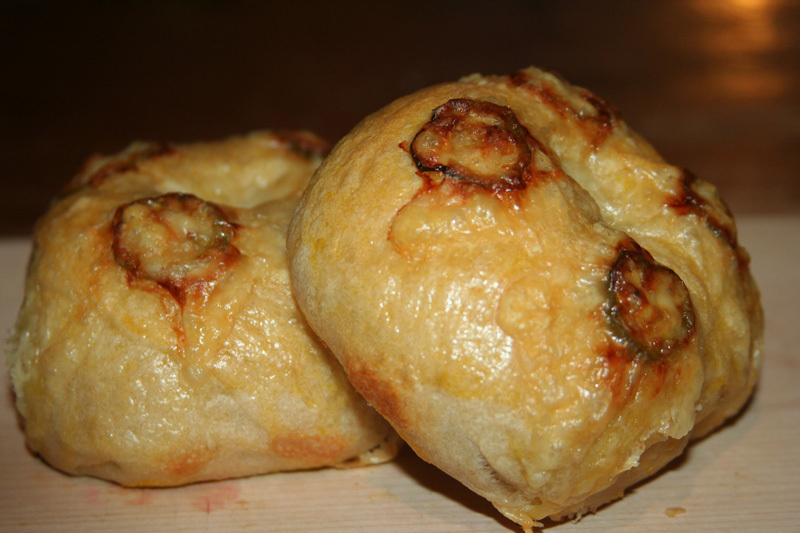 Jalapeno-cheddar bagels are my weakness…my mouth salivates just looking at this picture! Which flavor will you choose? Share your awesome flavor combinations with us in the comments, we always love more inspiration! An easy step by step tutorial for simple homemade sourdough bagels. Add your favorite mix-ins or toppings to create your own…mornings never tasted so good with these chewy and soft circles of joy. Using a dough hook in your stand mixer, combine sourdough starter, water, oil, flour and salt and let mix for about 30 seconds. Let sit for 10 minutes to allow the flour to absorb the liquid. Turn mixer on low and let it do it’s thing for 4 more minutes. 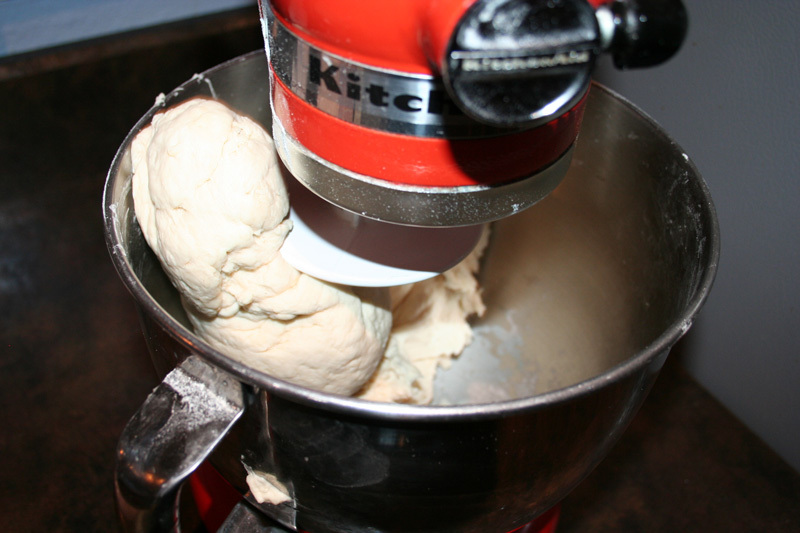 Your dough will be very dense and it may seem like your mixer is struggling. Remove dough and turn out onto a lightly floured surface (Jami’s tip of using a lightly floured tea towel worked like a charm!). 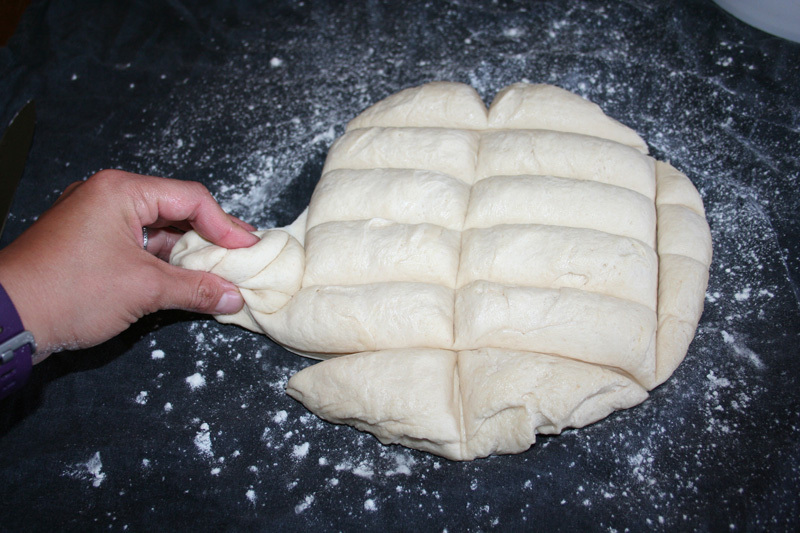 Divide the dough into 12 equal portions (a knife or pizza cutter work well for this step). Roll each portion into a ball, then pinch through the center with your thumb. 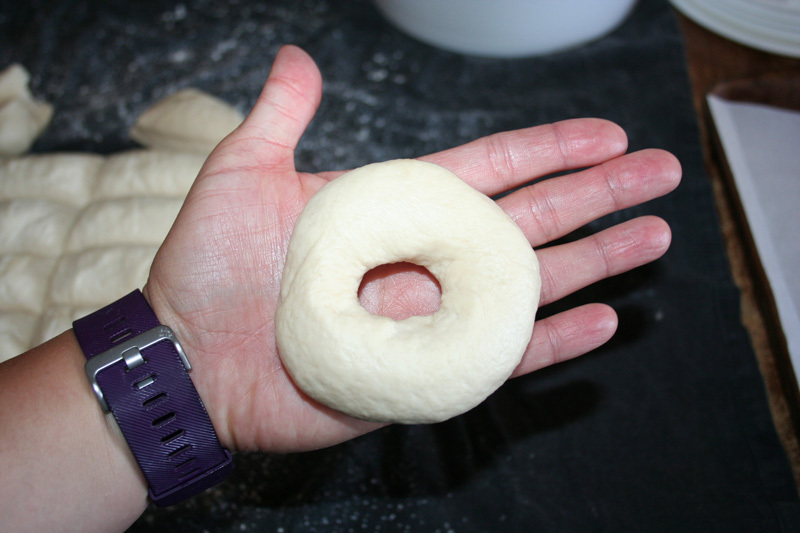 Gently stretch the dough into a bagel shape. I found over stretching them was important as the dough tends to want to shrink back. I aimed to have a hole about the size of a 50 cent piece. Place bagels onto a cookie sheet lined with parchment paper. Cover the bagels with a damp tea towel and let rest for one hour. Bring a large pot 2/3 full with water to a rolling boil and add 1 tablespoon baking soda. Preheat the oven to 450℉. Drop as many bagels as will fit into boiling water and cook for 30 seconds, flip each bagel and cook for 30 more seconds. Remove bagels and place on a lightly greased baking sheet. Continue step 8 until all bagels have been boiled. Brush the bagels with egg wash and top with desired topping, or a combination of toppings (see our favorites below). Place bagels in oven and bake for 15-20 minutes, or until bagels are cooked through and no longer doughy (you may need to rotate the pan halfway through baking). This recipe makes one dozen VERY LARGE bagels (bagel shop/bakery size), or 16 regular sized bagels. 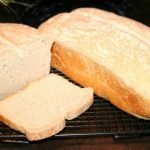 This recipe comes from Jami over at An Oregon Cottage, her recipe is whole wheat where I use organic unbleached white flour. I find the white flour lends to a lighter, fluffier end result. But the whole-wheat version is delicious in it’s own right! Everything bagel: sesame seeds, poppy seeds, dried onion flakes, dried garlic flakes, Parmesan cheese, kosher salt. Question before I try this recipe. I’ve attempted a couple of sourdough bagel recipes before, and every time during the proving period the surface dried out, so they did not actually rise and they sank in the pot of water. How can I avoid this and actually get my bagels to stay moist as they prove? I apologize for getting your name wrong. So sorry Kelsey! 😂 No problem at all! Thanks, Kelsey. It looks like this recipe uses a lot more active starter for the amount of flour that others I’ve tried, so that should help. I’m not sure if you’ll respond since the post is older, but I’m just wondering about the nutrition info. Two part question, first is the info for a dozen? Second, how do you calculate the caloric and nutrition info for the starter? It seems tricky. Anyway I’m hoping to delve into this as a sourdough and bagel lover! Great question Brenda. Yes, the nutrition info is calculated for 12 bagels. I calculate the starter based on 100% hydration. So I added 1 extra cup flour for the nutrition info (since my starter is basically 50% water and 50% flour by weight). If you make smaller or larger bagels, you’ll want to recalculate nutrition facts based on how many bagels one batch makes. It’s not a perfect science as everyone’s sourdough starter is slightly different and you may need more or less flour to make your dough. But it’s a good estimate. Enjoy! Wooo! Cannot wait to try this recipe. I have been looking for more “sourdough staples” to add to me repertoire! Glad that i found your blog, might even download the e-book! Thanks Laure! We’re glad you’re here! Sourdough recipes are among our favorites, so we’re always experimenting! Make sure to check out our Sourdough Sweet Potato Cinnamon Rolls…that’s our favorite experiment yet! Couple questions but a compliment first! We make these literally every single weekend they are so awesome (sometimes more often lol)! Not sure how I missed it (probably rushing and reading too fast! ), but I’ve been using bread flour just assuming that was what to use, would there be a difference using all purpose? Curious in case I should switch for even better results…My other question is for the blueberry option you mentioned. The dough is so stiff I was wondering if you had any advice on how to incorporate the blueberries in without them smooshing and bursting? Thanks in advance! Rose, sorry for the tardy reply…but first, THANK YOU! I’m so glad you’re enjoying these bagels! They’re a family favorite for us, too! To answer your questions, yes…using bread flour should be just fine! And as for the blueberries, you can always add a bit more water to get your dough a little wetter, but you’ll likely burst the blueberries anyway when mixing them in. Bagel dough is just a stiff dough. I’m not sure I’ve ever seen a blueberry bagel that’s not slightly purple throughout from the juice incorporating into the dough. I think it makes for a prettier bagel! 😉 Keep on enjoying them! These look great, just wanting to know Is the two cups of starter stir down or bubbly? Good question Lenore! Sorry for the delay in answering…I like to make this recipe at the height of my starters activity, so I measure it bubbly. Because all sourdough starters are different, you’ll want to pay attention to the dough consistency. So add your flour slowly. You may not need all the flour called for, or you may need a bit more! But you’re looking for a nice foldable dough, a little stiffer than regular bread, but not so dry the dough won’t stick to itself when folded over. Hope this helps! Thanks, besides reducing flour, suggestions for rounding? I think if your dough is a bit stickier, you won’t have issues rolling into a ball. 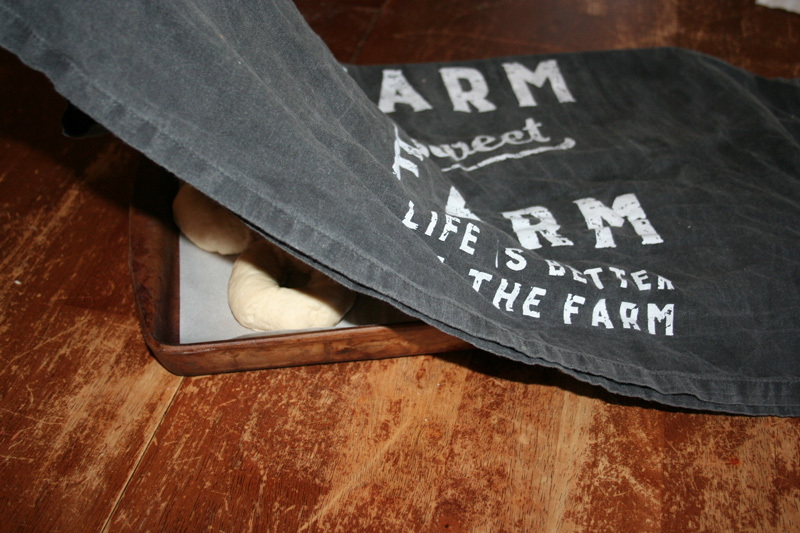 I just grab off a piece of dough and roll it between my hands (like playdough!). When it’s dry, it doesn’t like to stick to itself, so creating a ball is more difficult. Can’t believe I made bagels! Thank you! Delicious and gone too quick. Must double batch next time so I can have extra to freeze and share with friends. Any tricks on rounding the balls? I struggled. Tried wetting my hands, but that didn’t work. With such stiff and dry dough, they came out awesome, but ugly. Not a big deal, but I’d love to improve this step and am looking for tips. Going to try 5 cups of flour next time, but what are your thoughts? I tried using this dough recipe for a bagel dog. I used Eckrich cheese and jalapeno sausages. They were incredible. I had extra dough and made a few bagels per the recipe as well. My only issue was the bottoms of a few were just short of being burned. I either needed to turn down temp on oven a little, or use a lighter color or air bake pan. I used an old pizza pan which has darkened with age. I will be making these often. Thank you for the recipe! Oh wow! What an awesome idea Michael…now I’m craving a bagel dog! You can also try doubling up your pan in the oven, or making sure you’re cooking on the top rack. If they’re still too dark, try lowering your oven temp! Glad you’re happy with the recipe…it’s our favorite, too! These were beautiful when baked–I used a mixture of black and white sesame seeds, but I thought mine were a little blah tasting. I fed my dormant started for about a day and a half. One cup flour to 1/2 cup water each 12 hour feeding. Am I doing something wrong or am I just expecting it to be more sour than it should be? I am a newby. It doesn’t sound like you’re doing anything wrong Johnna. And welcome to the world of sourdough! 🙂 You’re not alone in your search for a more “sour” finished product. In order to get that sour flavor, you’ll need an extremely long soak (fermentation) time, which usually means doing a bulk fermentation in the refrigerator for 24-48 hours, then bringing back to room temperature to continue fermenting before baking. For me, this is more work/time than I’m willing to do, just for the sour flavor, and I haven’t found a bagel recipe that calls for this kind of fermenting time. We’re just into sourdough for the gut health, not necessarily the sour flavor, so we stick to the simple, everyday recipes that work for our family! I hope you find a recipe that’s more to your liking! And if you find a recipe for an extra sour sourdough bagel, come back and drop the link in the comments, I’m sure others will appreciate it! Happy baking! YUM! Sounds like an awesome flavor combination Koty! Glad you enjoyed them! I’m not sure what I am doing wrong. My bagels are hard to pick-up off my silpat which is what I let them rest on before boiling. Am I not putting enough flour in when I make the dough? Oh no! I’m sorry to hear your bagels are sticking Bobbi Jo. It could be that your dough is too sticky/wet, but it also may be that the dough doesn’t want to let go of the silpat (I haven’t tried using one to make bagels)? When working with the dough to form the bagels, it shouldn’t stick to your hands at all. If it’s even the littlest bit sticky, it’s too dry. And try laying your bagels on parchment paper, that’s what we use without problems. You could also try using a spatula to help lift them, but if they’re falling apart when you lift them up, they may not hold up well in the boiling water either. Hope this helps and that your next batch turns out fantastic! Thanks for getting back to me. I think the problem is my dough is too sticky/wet. I do have a problem with the dough sticking to my hands when making them. I did try the parchment paper and it was even worse. They do boil up ok, they just don’t have a hole in the middle. Looks more like a roll than a bagel. They do taste good though. Just want them to look like a bagel. Do I just add more flour than it calls for in the recipe or us less water. I do use the whole 6 cups of flour. Funny enough, I just made more bagels today! Your dough shouldn’t stick to your hands at all. My dough is dry enough that I have a hard time getting it to stick into a ball when rolling each bagel. You can either add more flour, or use less water, or a combination of both. 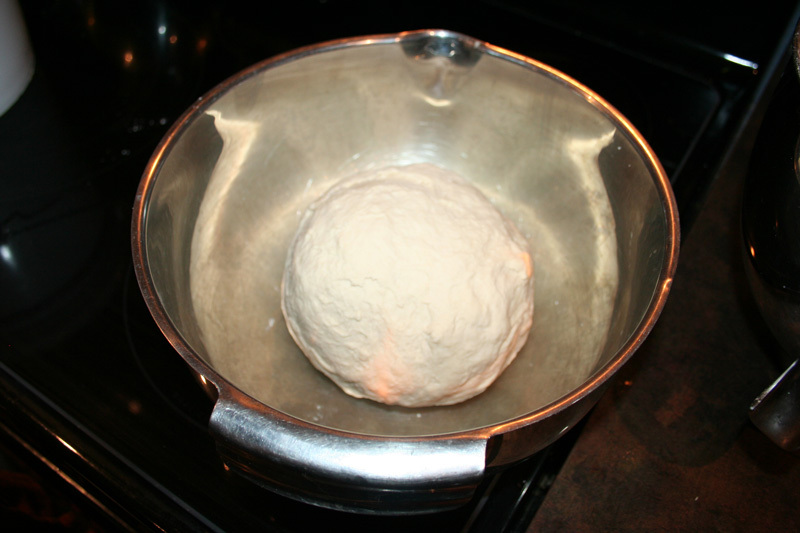 Before you let the dough sit for 4 hours it should be VERY stiff and dry (not wanting to stick to your hands at all). If you’ve made our sourdough bread recipe, it’ll be even dryer than that. The measurements will vary based on the hydration level of your sourdough starter. I keep my starter at 100% hydration. It’s like biscuit dough when I’m feeding it and like waffle batter when it’s active and ready to use. Hope your next batch looks like bagels! Oh, and you can always try stretching the hole larger when forming your bagels if they’re wanting to close back up! I make mine like a silver dollar or 50 cent piece in size (sometimes larger!). I finally got everything figured out and everyone loves my bagels. I’m wanting to make some cinnamon raisin ones and was wondering when do I put the cinnamon and raisins in and how much do I use of each one. Also, my bagels split on top when I bake them. Is it something I’m doing wrong. I brush them with milk then put ground Himalayan pink salt on top. These were great! The first time I made them the dough was too wet/soft and the bagels had a hard time holding their round shape-but still tasted great. The second time I added more flour for a very firm dough and then bagels turned out perfect! I added dried chopped onions for an onion bagel. Super great! Thanks! Is there a substitute for the avocado oil or is that a must? Just checking before I go get some! Thank you! Hi Kathy! Avocado oil isn’t a must, coconut oil, olive oil or other cooking oils will work just fine! Thank you Kelsey! I was reading your article on oil and decided to give the avocado oil a try! They were a little dense but not bad for a first try. I used 5 cups of whole wheat flour. Did you have a flour you recommend? If I stick with the whole wheat, next time I may use less and see if that helps. Hey Kathy, I use organic, unbleached white flour for our bagels. It’s what I’m currently feeding my sourdough starter with, too. It does make lighter bagels than whole wheat. You could always do a 50/50 mix of the flours to lighten it up a bit! Should I put an egg wash in bagels that are meant to be plain or that already have mix-ins rather than toppings? My husband is allergic to most strands of yeast. It is a very uncommon allergy according to his doctors and there is no treatment but to not eat it or be near it because even airborne can cause him to have huge rashes. However, I did a lot of research and we decided to try a from scratch sourdough starter. He had no reaction to the starter so we decided to move forward with making something. So I found your recipe after one failed attempt with another recipe that just disintegrated in the boiling water. I want to thank you, because my husband has been unable to eat any type of bread with yeast in it…ie everything but tortillas…for over 10 years. He cried…and not just a little swelling of the eyes, but a full on ugly cry. Thank you for inspiring me to try again. It may just be bread, but my husband is so very greatful I found your site. We will definitely be using it for many times to come. Just made these. So very good! I left my dough out on the counter overnight, rather than 4 hours. They may have been a little flatter than if I’d done it properly, but they were still so yummy. Crisp crust and chewy interior. Thanks for the recipe! Awesome Morgan! You can also let your dough rest out on the counter for a bit, then stick it in the fridge overnight and bring it back to room temp before proceeding to the next step! I’ve successfully done that before, too! Glad you liked them! Curious how you flavored yours? Made these yesterday and they tasted great, but when I put them into the boiling water they kind of flattened. Any suggestions about what might have gone wrong? Thanks! Oh no, what a bummer Rachelle! Glad they tasted great, but a flat bagel is a drag. When it comes to sourdough there can be so many factors. Did you remember to add the baking soda to the water? How long did you let the bagels rise? How recently had you fed your sourdough starter? How humid was the air? Were you super gentle while picking the bagels up to put in the water? Etc. Without watching your entire process it’s hard to troubleshoot. But if you loved the taste and are willing to give it another shot, I’d say go for it and hopefully the next batch will turn out better! I’ve had many “failed” loaves of sourdough bread and other sourdough recipes, and each “fail” was usually for different reasons. BUT, the best part about sourdough is that even the “failures” usually taste delicious! 😉 Best of luck on your next attempt! Made these today. I added a tablespoon non-diastic malt and a tablespoon pure maple sugar to the dough. Similarly, boiled in water with 4 tablespoon malt, 2 maple sugar. They came out perfectly. Thanks for sharing your recipe! 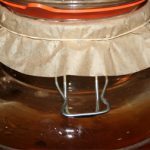 What is the easiest and safest way to start a sour dough starter. I have been reluctant to start one as I cannot smell and I am afraid I might mess it up or worse sicken my family. I’ve looked at different ones and see too many variables. I need one from a bread maker preferably. I make bread all the time so that part I’ve got down real well. Just need a starter. Thank you to anyone who can help me get started. It’d be my recommendation to find a local baker who is willing to sell you a cup. Once you have an active starter, with regular feedings, it’s hard to mess up! We’ve also purchased this starter culture and had great success! Best of luck! YES! Sourdough buddies are amazing Darcy! We have a great “sourdough community” as more and more people fall in love with sourdough! It’s always great to have friends who will gift you starter when needed! We also have a local bakery who will sell me a cup if ever needed! Thanks for sharing that tip! New to sourdough, but not to bread making. Is it necessary to have the mixer or can this be done by hand? Hi Jeanie…not at all! You’re welcome to mix this by hand! Consider it “arm day”! You’ll just want to make sure you knead it enough that you get a smooth, elastic consistency! Please let us know how it turns out! In the process right now of letting dough rest for 4 hours, can’t wait to try the bagels. 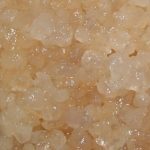 Is the sourdough starter listed in this recipe “active” starter or “dormant” starter? Great question Emily! It should be ACTIVE sourdough starter (fed within 4-12 hours). Best of luck! I made these and sorry to say we ate a dozen bagels in 2 days! They are the best! Better than any local bakery around me. Even my friend’s very picky little boy devoured one and asked for more. I made a slight change. I used unfed sourdough starter so added 1.5 tsp yeast. They rose perfectly. That’s awesome Theresa! Thanks for the feedback on the yeast, great tip for those “neglected starter” days! 😉 They’re the best, hot out of the oven…now you have me wanting to make another batch! These look delicious! Love that there are so many variations possible. All yummy, I bet. Thanks Carol! All SO yummy! Wow,so impressive and yummy. Love all those photos! I wish you could come over and make a batch for me right now! I used to work at a bagel shop in my late teens/early 20s and ate sooooooo many bagels back then, yet I’ve never had a sourdough one, which I’m sure my belly would love. I think bagels are a typical college staple! But yes, these sourdough bagels are a lot better for our tummies! And amazingly, taste better than the bagel shops (well, in my opinion anyway!). Wow! These look amazing!!! I have never made bagels before, but I can imagine they are so good hot and fresh out of the oven. YUM! YES! That’s when they’re the absolute best…but they’re also so great toasted! These looks fabulous. You make me want to get the butter! Right? There’s not much better than a hot bagel slathered with butter! Bagels are fun to make and eat. That is so cool. I want to try this. Those look absolutely delicious. My family is going to love these! Thanks Raia! They’re a hit with family and company!